Researchers have made progress—let’s keep the momentum going! We need your help! New blood samples from affected dogs are needed. Please send in a blood sample from your dog with idiopathic/primary epilepsy for Dr. Ned Patterson’s Aussie Epilepsy research at the University of Minnesota. Please see the information below to submit a blood sample from your dog. 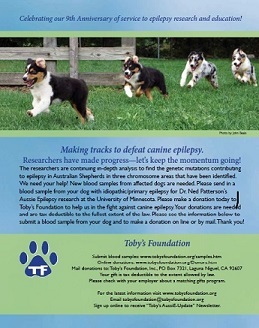 Please make a donation today to Toby’s Foundation to help us in the fight against canine epilepsy. Your donations are needed and are tax deductible to the fullest extent of the law. Please see the information below to make a donation online or by mail. Thank you!